The dirty secret of the food movement is that the much-celebrated small-scale farmer isn’t making a living. After the tools are put away, we head out to second and third jobs to keep our farms afloat. Ninety-one percent of all farm households rely on multiple sources of income. Health care, paying for our kids’ college, preparing for retirement? Not happening. With the overwhelming majority of American farmers operating at a loss — the median farm income was negative $1,453 in 2012 — farmers can barely keep the chickens fed and the lights on. Others of us rely almost entirely on Department of Agriculture or foundation grants, not retail sales, to generate farm income. And young farmers, unable to afford land, are increasingly forced into neo-feudal relationships, working the fields of wealthy landowners. Little wonder the median age for farmers and ranchers is now 56. But what about the thousands of high-priced community-supported agriculture programs and farmers’ markets that have sprouted up around the country? Nope. These new venues were promising when they proliferated over a decade ago, but now, with so many programs to choose from, there is increasing pressure for farmers to reduce prices in cities like my hometown, New Haven. And while weekend farmers’ markets remain precious community spaces, sales volumes are often too low to translate into living wages for your much-loved small-scale farmer. ...we’re now competing with nonprofit farms. Released from the yoke of profit, farms like Growing Power in Milwaukee and Stone Barns in Pocantico Hills, N.Y., are doing some of the most innovative work in the farming sector, but neither is subject to the iron heel of the free market. Growing Power alone received over $6.8 million in grants over the last five years, and its produce is now available in Walgreens stores. 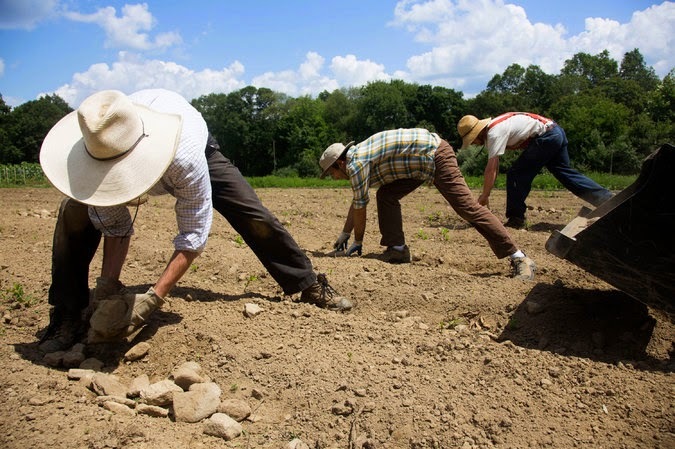 Stone Barns was started with a $30 million grant from David Rockefeller. How’s a young farmer to compete with that? Unlike our current small-bore campaigns, previous food movements of the 1880s, 1930s and 1970s were led by highly organized farmers’ organizations — like the American Agricultural Movement, National Farmers Union and Colored Farmers’ National Alliance — trailblazing new paths for the economy. They went toe to toe with Big Ag: crashing shareholder meetings; building co-ops and political parties; and lobbying for price stabilization. In the late 1970s, for example, small-scale family farmers organized a series of protests under the slogan “Parity Not Charity,” demanding a moratorium on foreclosures, as well as the stabilization of crop prices to ensure that farmers could make a living wage. They mobilized thousands of fellow farmers to direct action, including the 1979 Tractorcade, where 900 tractors — some driven thousands of miles — descended on Washington to shut down the nation’s capital.